My husband had a craving for scones for breakfast, with orange marmalade and a big cup of tea. I decided to bake some - not a big deal - but I couldn't find an orange marmalade I wanted at the store so I figured I'd just make my own. You can adapt this recipe - just use about equal amounts of oranges (or other citrus fruits) and sugar. I used homemade vanilla sugar for part of it, which is just regular sugar with a few spent sticks of vanilla bean. I always keep my scraped-out beans in a jar of sugar - it's a smart way to get every last bit of flavor out of those expensive beans! If you don't have any, just use a vanilla bean, cut in half and with all the little seeds scraped out into the oranges. I also used light muscovado sugar, which is a raw sugar with hints of caramel. Very yummy, and it gave the marmalade it's deep, dark color. Scrub the oranges in hot water. Cut each into eight wedges, and thinly slices each wedge. (I remove the seeds at this point.) Place in a wide thick-bottomed pot and add the lemon juice. Add water to cover. Bring to a boil, and cook until the orange peel has softened - about 20 minutes. Add the sugar. Bring to a boil again, and cook for 30-40 minutes - this will depend on your pot as well as on your amount of water. 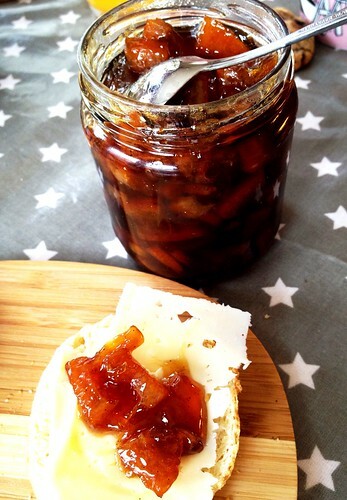 Make a "marmalade test" - use a small, cold saucer (place it in the freezer beforehand) and add a spoonful of hot marmalade. Run a spoon through it. If the marmalade runs together, it needs more cooking. If the spoon leaves a clean trail, you're done. Pour into clean jars with tight-fitting lids. I love this recipe idea of yours and I will give it a try within the next few days! Thank you so much for posting it, I'm a sucker for marmalade so I know it's going to be great! As an American of Swedish descent & looking for recipes from my heritage, I am glad to find this blog. Thank you.